There are countless resources where you can find examples of good typography on the web, but if you’re looking for anything designed in a language that doesn’t use the roman alphabet, things get a little harder. As a digital creative studio in Tokyo, we spend a lot of our time designing Japanese websites. And as part of the research process, we often come across great examples of fantastic typography and design. Here is a selection of websites that recently caught our attention through their smart use of Japanese type. 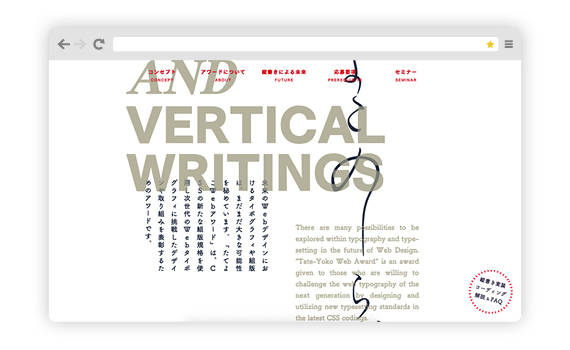 We wouldn’t have expected anything less than a highly experimental design for a website awarding ‘horizontal and vertical writings’ on the web, and the Tateyoko Awards didn’t disappoint. You could argue that readability is compromised in some sections, but it certainly highlights how far Japanese web type has come with the help of CSS. The antiquated method of using text as graphics here is forgivable since it is so minimal, and also because everything else is so well put together. We like the way headline text comes in as you scroll down the page. Nice touch. Modern, contemporary color and layouts complement the use of Futura and Yu Gothic to great effect. Beautiful photography supplements the restrained layouts and delicate typography. Great use of traditional vertical text throughout (menu included! ).